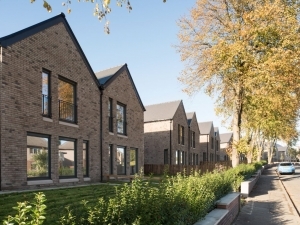 The Muirskeith Road development of 31 houses and flats in a compact, urban brownfield site, 13 two-bed and 13 three-bed homes, mostly semi-detached, and four cottage flats. 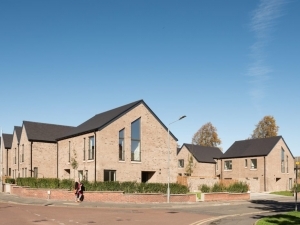 The development is located on the grounds of a former nursing home in the Southside of Glasgow on previously contaminated land which Home Group is transforming using innovative designs to develop houses and flats for social rent, as well as an extra care housing unit for local social services. All properties, which hold a ‘very good’ eco homes rating and meet Secure By Design standards, benefit from parking in specially designed courtyards to the back of the properties which prevent on-street parking on the nearby main road. Large windows to the front of properties provide maximum light, and gardens are laid to lawn front and rear.